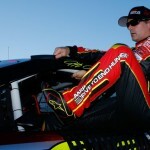 Jeff Gordon finished a solid 7th at New Hampshire Motor Speedway and built a small cushion over the Chase cutoff with one race to go before the next round. 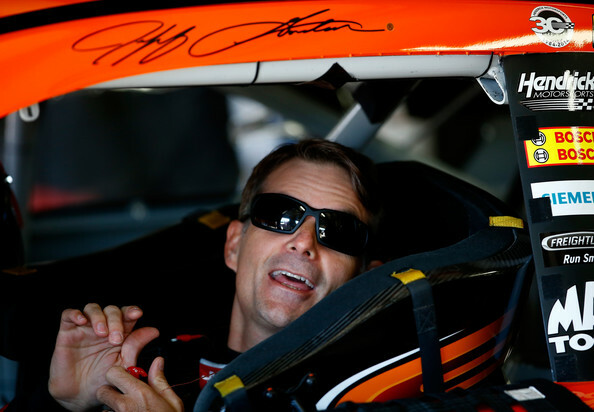 Gordon started his NASCAR record-setting 789th consecutive race, which broke Ricky Rudd’s Iron Man record. 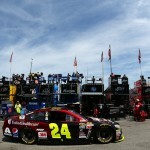 Gordon started 10th and battled handling issues at the outset. He slipped to 12th by lap 15. The first caution came on lap 37 for Aric Almirola’s cut tire and wall contact. 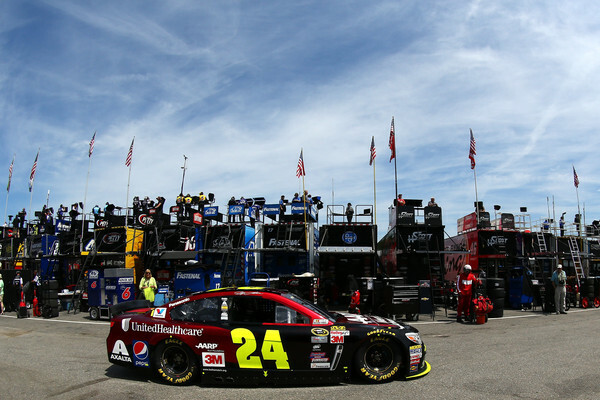 After chassis adjustments, Gordon restarted in 14th place on lap 42. He moved up to 11th on lap 47, just before a caution for Landon Cassill’s power steering leak. Gordon ran 12th when the caution waved on lap 60 for Tony Stewart’s cut tire. Gordon came to pit road for a 2-tire change and restarted in 25th place. He gained spots after the restart on drivers who hadn’t pitted and ran in 18th place on lap 80. Gordon advanced to 15th by the time the next caution waved on lap 120 for Alex Bowman’s wall impact. Pit stops followed with Gordon restarting in 18th place. 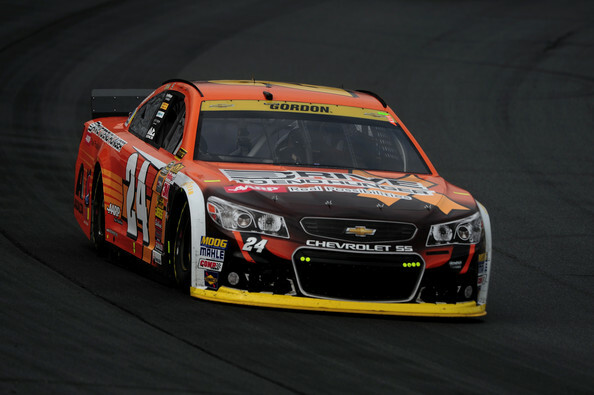 At the halfway point, Gordon ran in 14th place. A caution for Kyle Busch’s wall contact brought out the caution on lap 160. Gordon came to pit road in 13th place and restarted in 11th. However, he slipped back to 17th after the restart when he was caught in the middle line. He regrouped over the next 10 laps and ran in 13th place on lap 175. Gordon advanced to 11th before a debris caution on lap 190. Pit stops followed with Gordon losing 4 spots and restarting 15th. 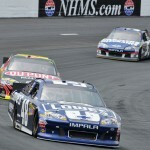 He gained a spot when Jimmie Johnson pitted with a flat tire. On lap 205. the day’s hardest crash occurred when Danica Patrick, following contact from Ryan Newman, backed into the wall and collected David Ragan. The melee allowed Gordon to move into 12th place. After the restart, Gordon slipped to 13th before a caution for Brett Moffitt’s spin. Gordon came to pit road and restarted in 14th place with 86 to go. He held 14th until a caution for Justin Allagaier’s cut tire with 63 laps to go. Gordon came to pit road and restarted in 20th place. 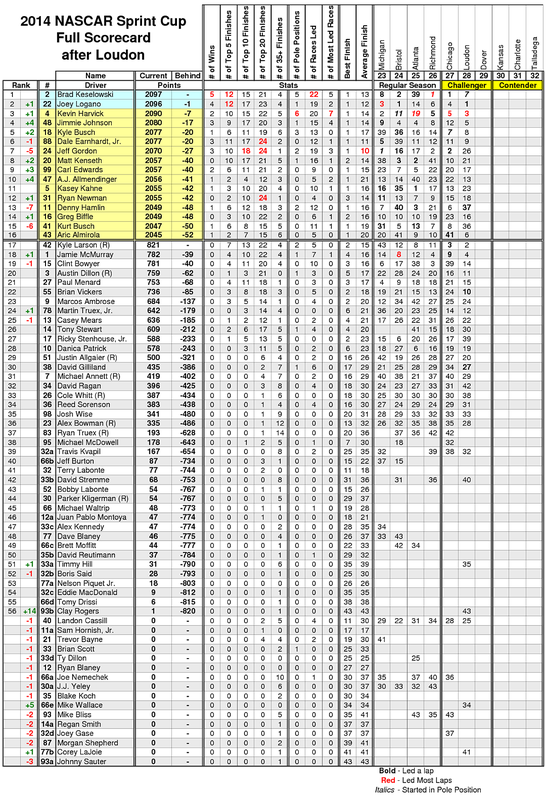 With 50 to go, Gordon moved up to 16th place. He followed Jimmie Johnson around slower cars and ran 13th with 45 to go. Gordon re-entered the top-10 with a move around Dale Earnhardt Jr with 38 to go. He took 9th from Kasey Kahne with 29 to go. 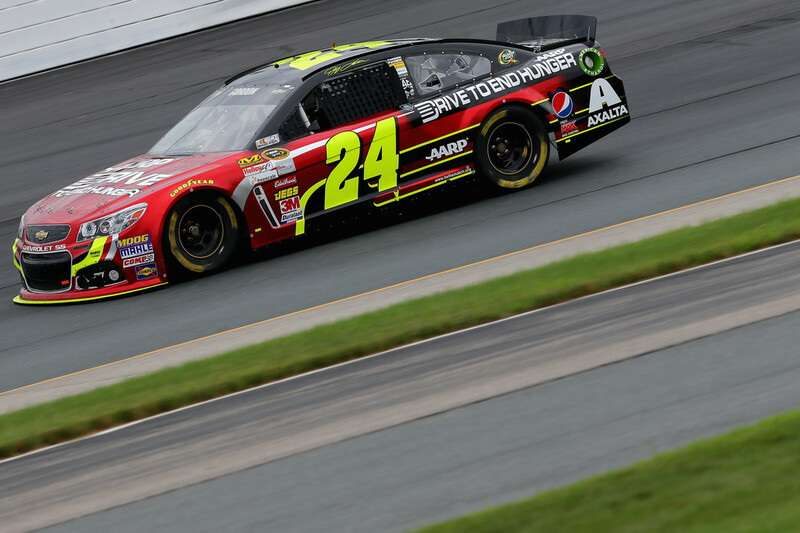 As drivers ran out of fuel, Gordon picked up two more spots in the closing laps to finish in 7th place. 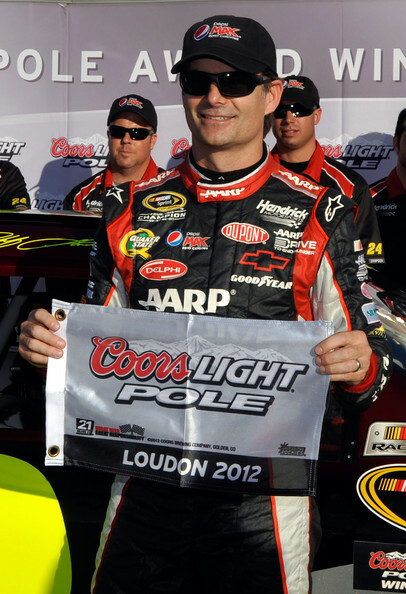 It was his best finish at Loudon since 2012. 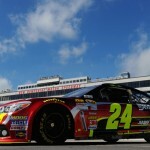 Jeff Gordon finished a hard-fought 9th in the 5-Hour Energy 301 in Loudon. Gordon started 23rd, but ran the balance of the event in the top-10. The 9th place finish was his best at Loudon since 2012. Gordon started 23rd and moved into the top-20 by lap 10. The first caution waved on lap 22 for debris, with Gordon running in 16th place. Pit stops followed with Gordon opting for 2 tires and restarting in 15th place. He passed Denny Hamlin to take 13th on lap 40. One lap later he took 12th from Jimmie Johnson. He tracked down Kasey Kahne to take 11th on lap 51, and entered the top-10 on lap 53 with a move around Jamie McMurray. 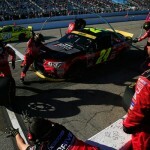 Gordon remained on the track to lead a lap during a green flag pit stop sequence before coming to pit road on lap 91. A caution for debris on lap 95 slowed the field. 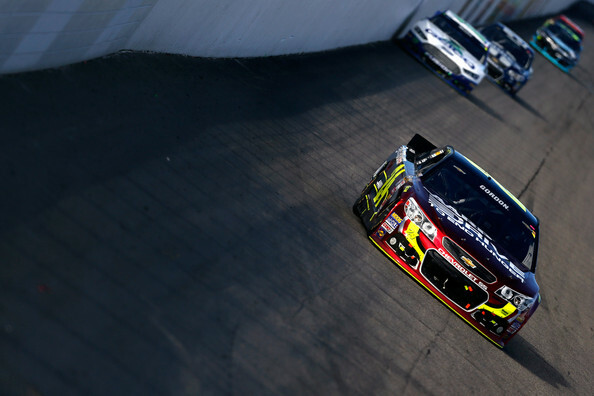 Gordon restarted in 12th place on lap 106. He re-entered the top-10 with a move around AJ Allmendinger on lap 110. 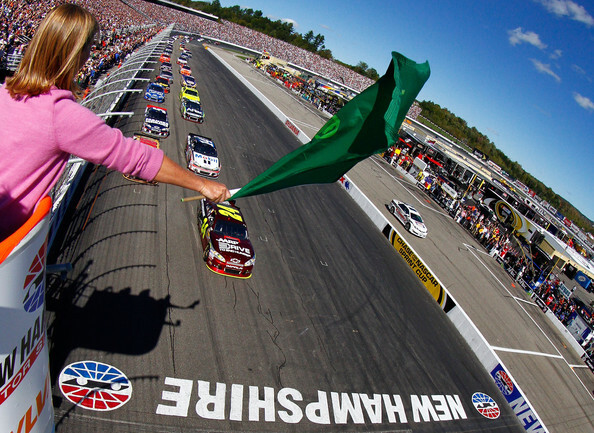 The next caution waved on lap 116 for debris. Gordon stayed out and restarted in 9th place. At the halfway point, Gordon ran in 9th place. On lap 160, he took 8th from Joey Logano. Gordon came to pit road for a green flag stop on lap 176. A debris caution slowed the field on lap 187. Gordon came to pit road for 2 tires and restarted in 14th place. He quickly moved up to 11th place prior to a caution for Paul Menard’s spin on lap 199. Gordon stayed out and restarted in 10th with 97 to go. He briefly took 9th before Austin Dillon passed to send him back to 10th with 86 to go. Ryan Newman passed to take a spot with 50 to go. Gordon ran 12th when the caution waved with 49 to go. Pit stops followed with Gordon restarting in 11th place. He entered the top-10 with 43 to go and moved to 9th with a 3-wide move entering turn 1. However, his forward progress stalled and he finished the event in 9th place. At the front of the field, Kyle Busch claimed his 3rd win in the last 4 races as he makes a summer charge to make the Chase after missing nearly half of the season. 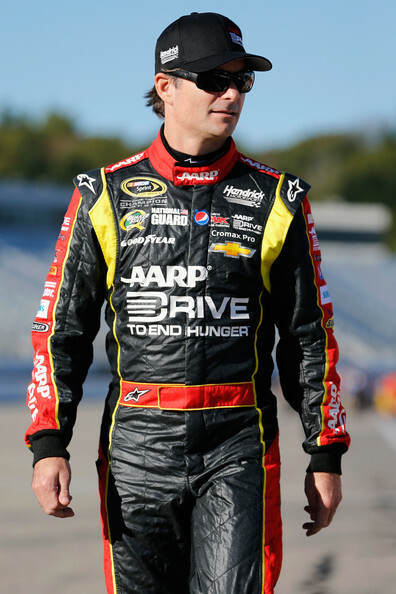 Jeff Gordon finished 26th at Loudon after a late-race cut tire while running in 6th place. Gordon has a points cushion heading to Dover for the Chase cutoff into the next round, but cannot afford another sub-20th place effort. Kasey Kahne, and Ryan Newman. The wreck was triggered when Matt Kenseth got loose and slowed directly in front of Busch. Brad Keselowski brought out the next caution with a spin on lap 192. On the restart on lap 199, Gordon moved ahead of Brian Vickers to take 3rd. Ricky Stenhouse’s spin brought the caution out on lap 202. Gordon dropped to 4th before a debris caution on lap 210. Vickers and Casey Mears stayed on the track and Gordon restarted 5th with 85 laps to go. He fell to 6th place on the inside line before a caution for Kurt Busch’s cut tire with 79 to go. Gordon moved into the top-5 with 70 to go and took 4th from Matt Kenseth two laps later. A debris caution on lap 246 brought Gordon to pit road for 2 tires. He ran in 19th place with 48 laps to go. Gordon ran in 17th place when Corey LaJoie spun to bring out a caution with 43 to go. Gordon came back to pit road for tires and restarted in 22nd place. He moved to 13th before a caution for Ricky Stenhouse’s crash with 33 to go. Gordon advanced into the top-10 before a caution for Matt Kenseth’s spin. 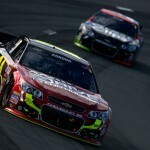 With 23 to go, Gordon took 7th from Dale Earnhardt Jr. He passed Jamie McMurray for 6th with 17 laps to go. With 8 to go, Gordon cut a tire and drilled the turn 1 wall to bring out a caution. Gordon crossed the finish line in 26th place after several pit stops to fix the damage (which didn’t go very well). It was just his 4th finish outside the top-20 in 2014. Coincidentally, he also finished 26th at Loudon in July. 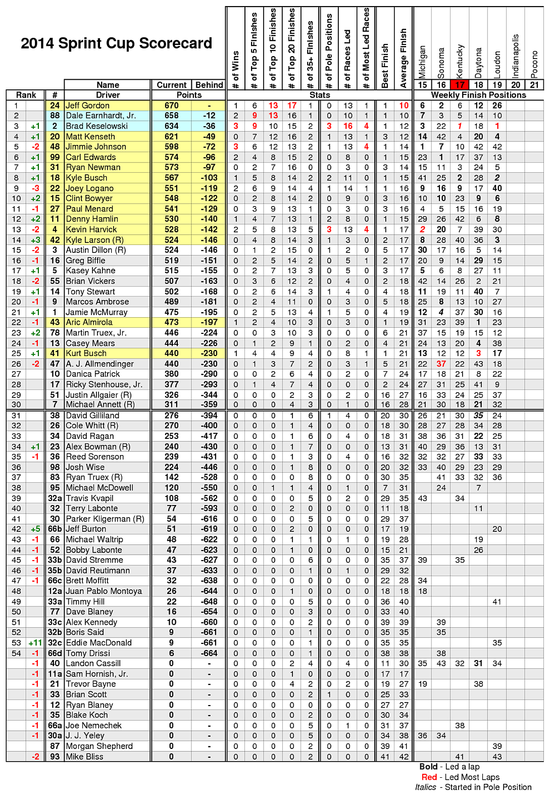 Gordon has a 21-point cushion in the standings heading into the Dover cutoff race for the next round of the Chase. A cut tire with 8 laps to go altered Gordon’s Chase standing. 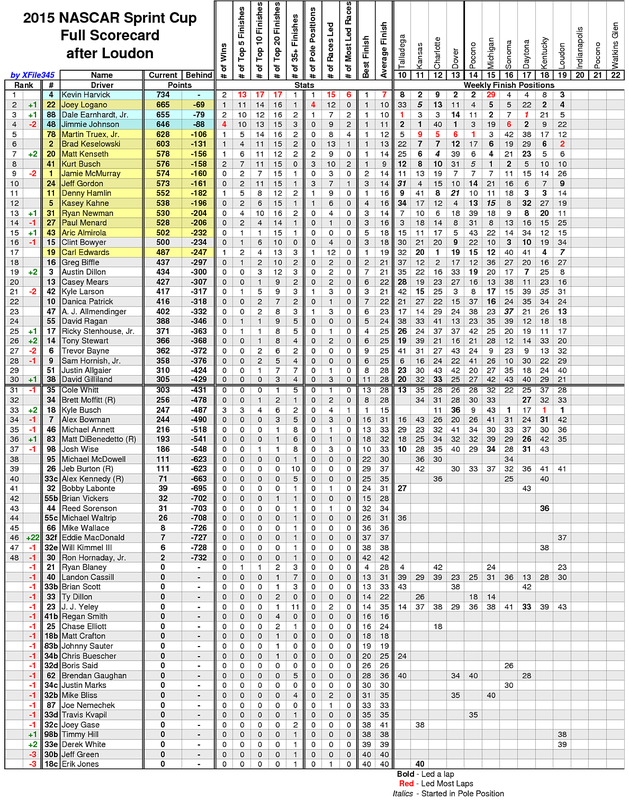 SEVENTH IN POINTS. 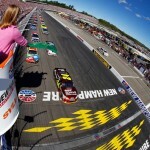 TALK ABOUT HOW YOU FEEL WHERE YOU STAND GOING TO DOVER. 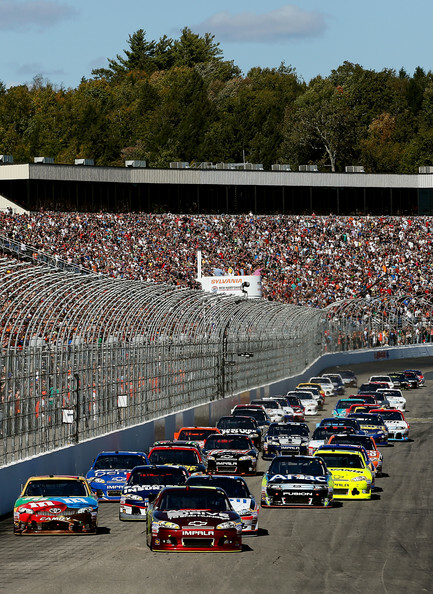 Brad Keselowski dominated the Camping World 301 at New Hampshire Motor Speedway by leading nearly half of the race en route to his second win in the last three weeks. 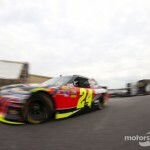 Jeff Gordon finished 26th after an up and down day where he made a late race gamble to make it to the finish on fuel, but came up 3 laps short when the race went into extra time. 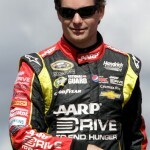 Nevertheless, he holds a 12 point lead in the NASCAR standings. 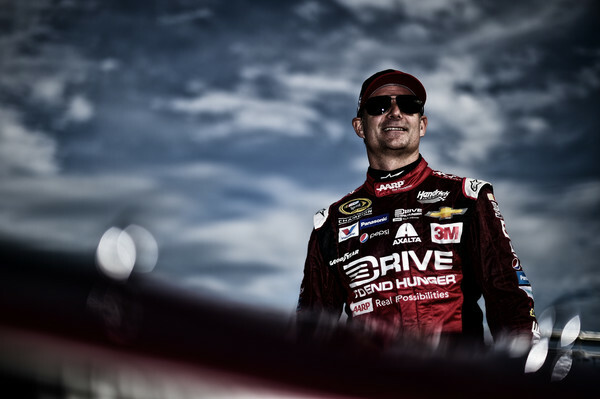 It snapped his streak of 17 consecutive top-15 finishes at Loudon. 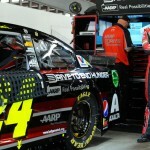 Gordon started 11th and moved into the top-10 when Jimmie Johnson cut a tire on lap 8. The first caution waved on lap 13 after Johnson cut another tire and wrecked in turn 1. Gordon advanced to 7th by lap 22, but struggled with tight handling as the run progressed. 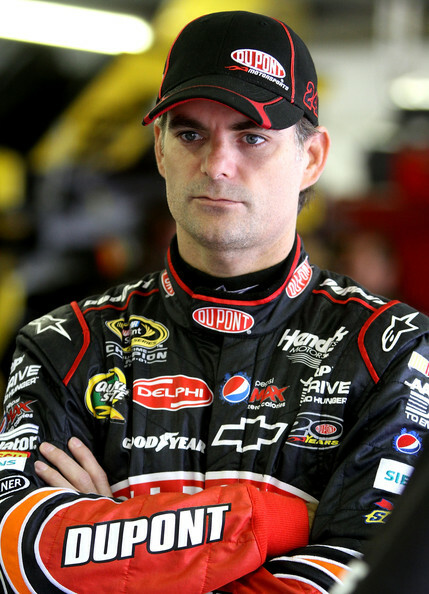 He dropped to 9th by lap 40 and fell to 10th when Kevin Harvick passed on lap 43. His slide continued as Dale Earnhardt Jr sent him to 11th on lap 46. Gordon lost 3 more spots over the next 10 laps and ran 14th on lap 56. His handling woes dropped him outside the top-20 on lap 60 and he complained the car was “undrivable.” Gordon dropped to 25th prior to a green flag pit stop on lap 75. Following the stop it was determined that Gordon’s right rear tire had developed a slow leak which hindered the car’s handling. When the pit stop sequence cycled through, Gordon ran a lap down in 26th place. He passed Greg Biffle to take 25th by the 100-lap mark. The second caution waved on lap 112 for phantom debris. 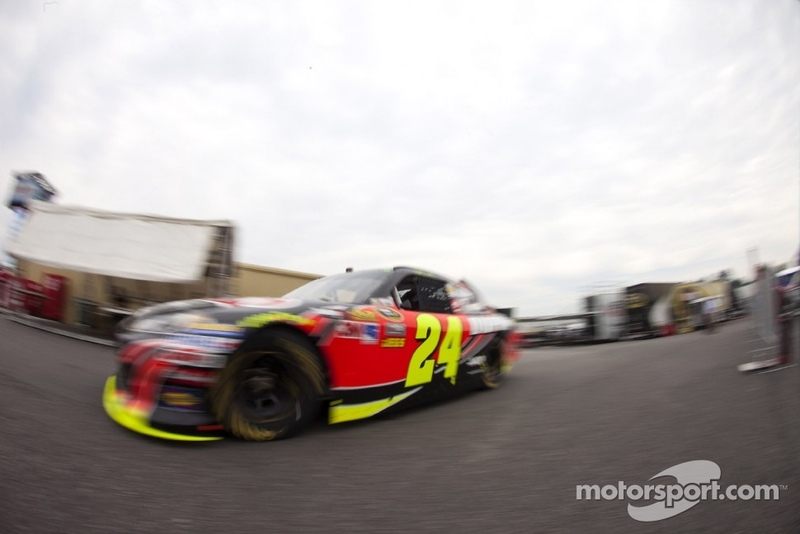 Gordon stayed on the track for the wave-around to get back on the lead lap. He restarted in 22nd place on lap 117. 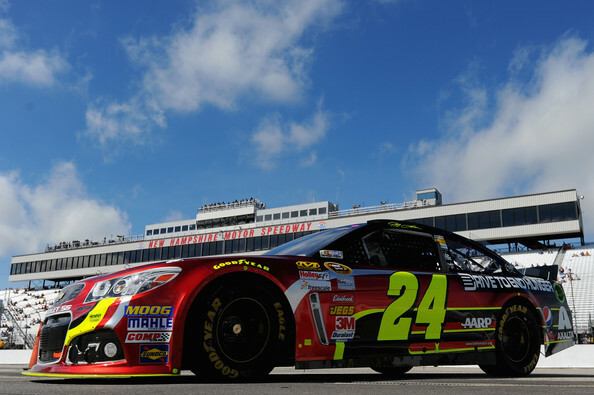 Gordon was unable to make headway and ran 22nd at the halfway point of the race. A debris caution on lap 153 allowed Gordon to come to pit road and get on the same pit sequence as the leaders — while also allowing him to get four tires. He re-entered the top-20 after the restart on lap 157 and took 19th from Paul Menard on lap 160. 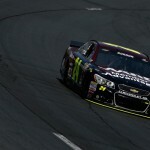 Gordon took 15th from Kurt Busch on lap 171 as his forward march on four tires continued. The next debris caution came at lap 176 and Gordon came to pit road for fresh tires. He restarted in 16th place on lap 180 and worked through race traffic to pick up 3 spots in the next 10 laps. At the 200-lap mark, Gordon ran in 11th place. He re-entered the top-10 for the first time since the early stages after Joey Logano crashed on lap 211. Gordon opted for two tires and restarted in 3rd place. He got a poor restart on the inside line and dropped to 7th on lap 220. He regrouped and took 6th from Kasey Kahne on lap 225, and entered the top-5 on lap 233. A debris caution with 52 laps to go brought the leaders to pit road for the final time. Gordon stayed on the track and assumed the race lead. 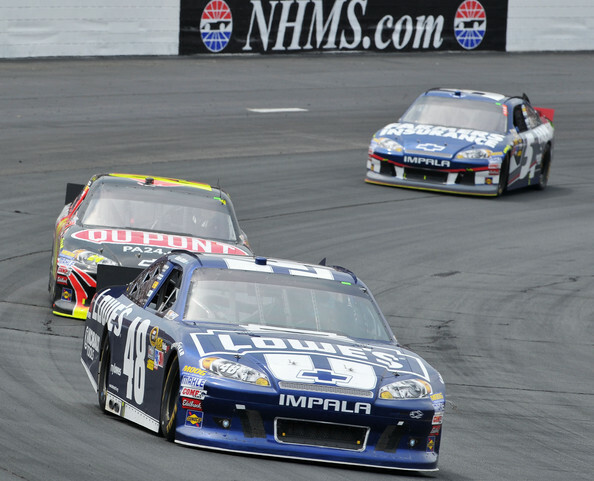 Gordon led until lap 270 when Brad Keselowski took over the top spot. With 20 to go, Denny Hamlin pulled to the outside and took a spot from Gordon. He conserved fuel to try and make it to the finish and backed off on his overall lap times. A caution for Justin Allgaier’s crash with 3 laps to go set up a green/white/checkered finish. Hamlin came to pit road for fuel. Gordon stayed on the track, but ran out of fuel under the caution period. He needed a push from a safety vehicle to get back to pit road for fuel. 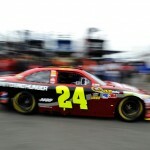 He remained on the lead lap and finished the race in 26th place. Gordon was running 5th when the caution waved with 52 laps to go. He stayed on the track and inherited the race lead, but had to complete the distance on the edge of his fuel window. WAS IT UNEXPECTED TO RUN OUT OF FUEL? WHAT DO YOU TAKE AWAY FROM TODAY THAT YOU CAN USE HERE IN SEPTEMBER? DID ANYONE HAVE ANYTHING FOR RACE WINNER, BRAD KESELOWSKI TODAY? THEY SEEM TO BE VERY STRONG. 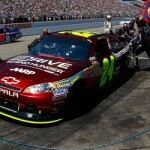 Jeff Gordon seemed to be in control of the Sylvania 300 at New Hampshire Motor Speedway. He led more than 30 laps as the race approached 100 laps to go. 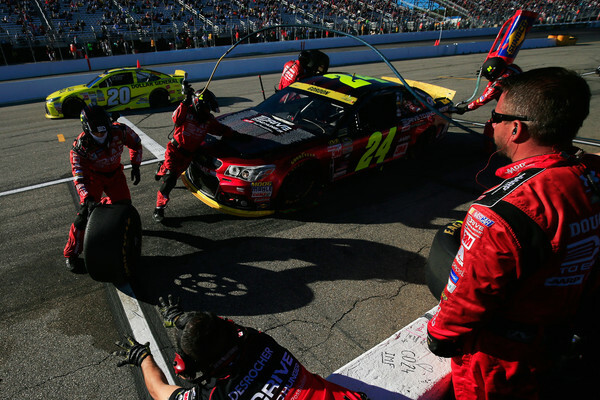 However, a costly mistake on pit road dropped Gordon back to 22nd place. He slid through the pit box onto the white line and had to back up. In the final stages, Gordon moved from 22nd up to 15th to salvage the day. He trails race winner and points leader Matt Kenseth by 42 — the equivalent of a full race. Gordon started 3rd and took the runner-up spot from Ryan Newman at the end of lap 3. He held the spot until the competition caution on lap 30. After taking two tires, Gordon made contact on pit road with David Ragan who was entering his stall. The contact wrinkled the sheet metal in front of Gordon’s right front tire. He restarted in 6th place on lap 34 and quickly moved to 5th by lap 35. Two laps later the caution waved for a wreck involving Jamie McMurray and Kevin Swindell. On the restart, Gordon fell to 7th on the inside line. Bobby Labonte’s cut tire and subsequent crash brought out the caution on lap 52. Gordon moved to 6th after the next restart and took 5th from Brad Keselowski on lap 62. Twenty laps later he advanced to 4th with a move around Newman. Gordon assumed the lead on lap 110 during a green flag pit stop sequence. He came to pit road one lap later for a four-tire change. 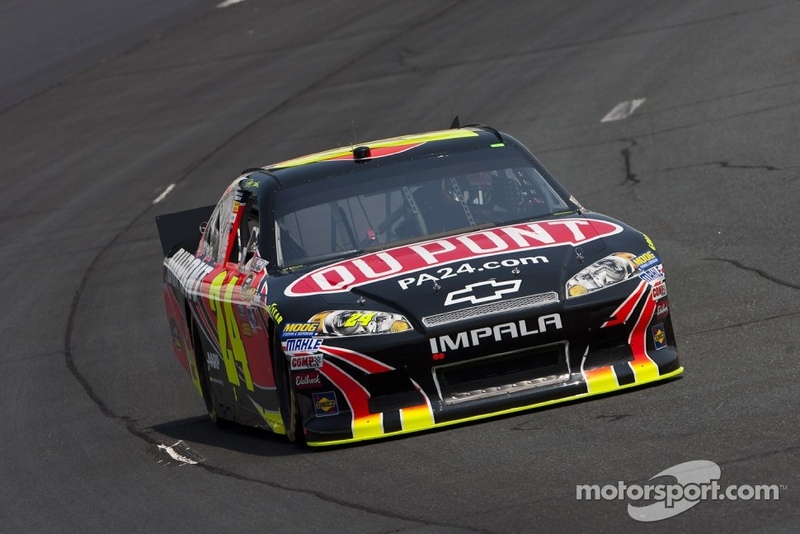 Followng the stops, Gordon cycled through in 5th place behind Keselowski. 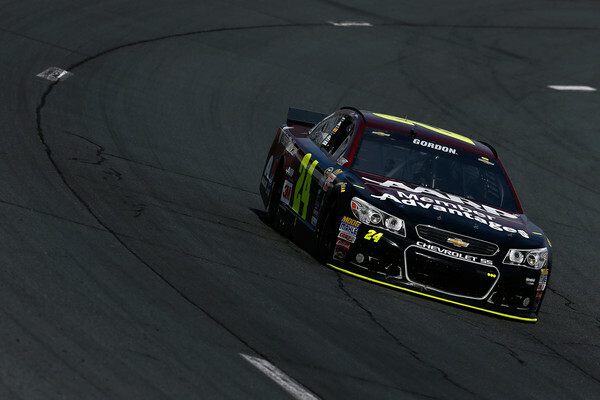 At the halfway point, Gordon advanced to 4th by passing Kasey Kahne. A caution on lap 164 brought the lead lap cars to pit road. Gordon’s crew opted for two tires and restarted with the race lead. A debris caution with 100 to go slowed the field. Gordon slid through his pit box to the white line and needed to back up prior to a four-tire pit stop. He restarted back in 22nd place with 95 to go. 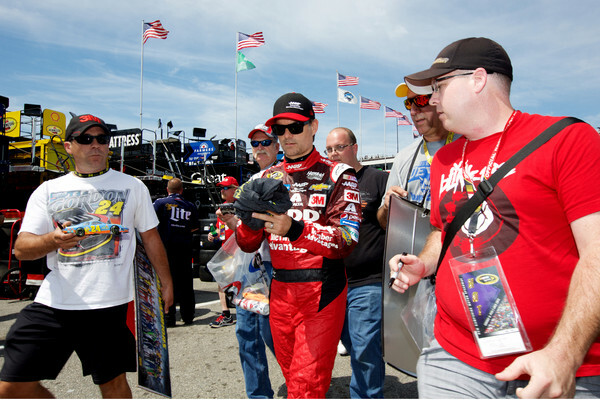 He re-entered the top-20 with 85 laps to go and took 19th from Juan Pablo Montoya with 83 to go. Gordon had moved to 16th when the caution waved for David Gilliland’s engine with 55 laps to go. 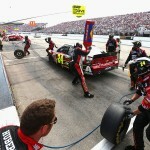 The #24 crew changed right side tires and Gordon restarted in 14th place. He moved to 13th just before Kahne crashed on the frontstretch — which effectively destroyed his teammate’s Chase hopes. On the restart, Gordon was caught in the middle line and dropped to 20th place with 40 laps to go. He steadily gained spots back and finished the race in 15th place. Gordon came to pit road with the race lead with 99 laps to go, but slid through his pit stall and dropped back to 22nd place on the track. The loss of track position ended his chances for a victory. 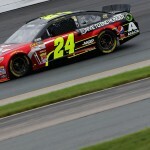 Although he ran in the top-10 for the balance of the Camping World RV 301 at New Hampshire Motor Speedway, Jeff Gordon needed a late-race rally to post a hard-fought 10th place effort. Gordon fell to 19th after a pit stop with 80 to go, and then overcame a spin with 44 laps to go. He went from 25th to 10th in the final 40 laps. 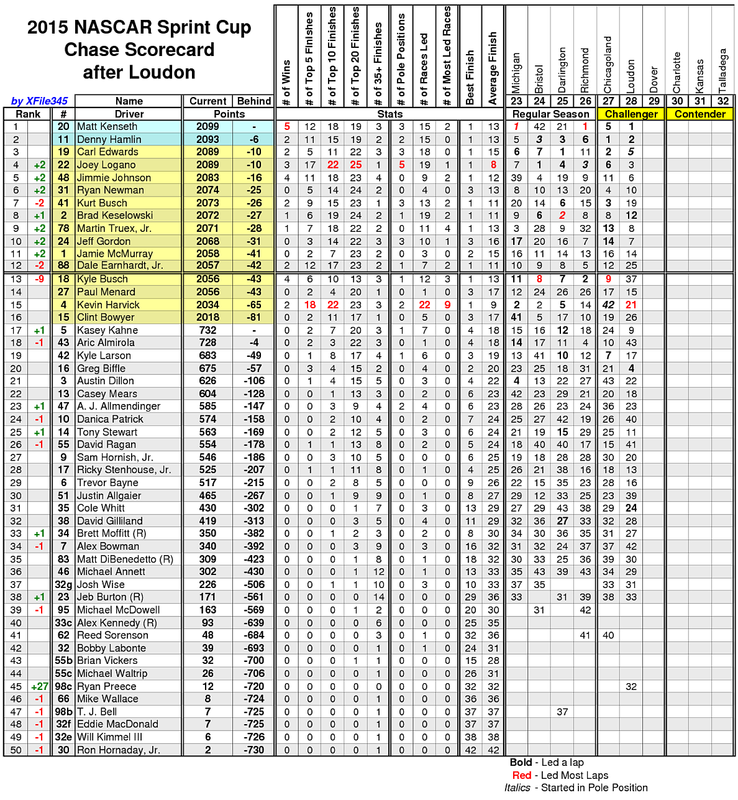 Gordon moved up to 11th in the series standings, 2 points outside the top-10 Chase cutoff. 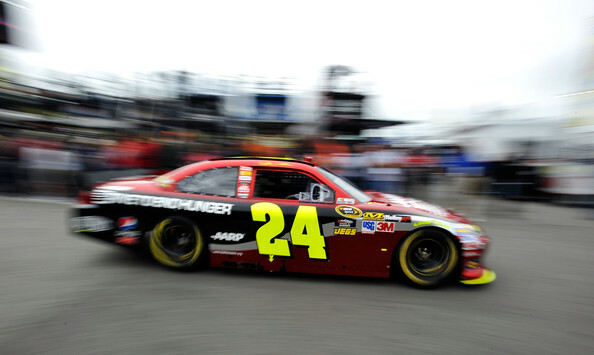 Gordon started 5th on an overcast day in New England. The first caution waved on lap 5 for Joey Logano’s spin and wall contact in turn 1. On the restart, Gordon dropped to 6th when Denny Hamlin went by. The second caution came on lap 14 for Marcos Ambrose and Casey Mears colliding on the frontstretch. Gordon moved around Dale Earnhardt Jr to take 4th on lap 22. However, while battling a tight handling issue, he fell to 5th on lap 55 when Matt Kenseth passed. Gordon came to pit road for a green flag stop on lap 77 and returned to the race in 6th place. Following a debris caution, Gordon gained 2 spots on the restart to run 4th on lap 85. He fell back to 5th prior to a caution for Denny Hamlin’s cut tire on lap 123. On the ensuing round of pit stops, Gordon opted for 4 tires and restarted in 10th place. He moved around Carl Edwards and ran 8th on lap 133. Gordon dropped to 9th just before a debris caution at the halfway point of the race. Gordon changed two tires and restarted in 8th. Gordon advanced to 6th by lap 180. He gained 3 spots during a round of caution flag pit stops with 100 laps to go. However, on the restart on the inside line, Gordon fell to 6th before a debris caution on lap 210. Following a caution for Danica Patrick’s spin, Gordon came to pit road for 2 tires. He fell from 8th to 19th after a slower car came in for a stop directly ahead of him on exit. The next caution waved on lap 225 after Matt Kenseth hit Kurt Busch, which collected Ryan Newman. Gordon held the low line and advanced to 17th place. However, he lost 3 spots on the restart prior to the next caution on lap 238 for a crash involving Ricky Stenouse, Danica Patrick, and Travis Kvapil. Gordon came to pit road for tires and restarted in 25th place on lap 242. On fresher tires, he advanced to 20th with 50 laps to go. With 44 to go, Paul Menard hit Gordon coming off turn 2, sending the #24 car into a spin. Gordon came to pit road for tires and restarted in 25th. He moved to 20th with 35 laps to go and took 18th from Clint Bowyer with 28 to go. Two laps later he passed Menard for 17th. 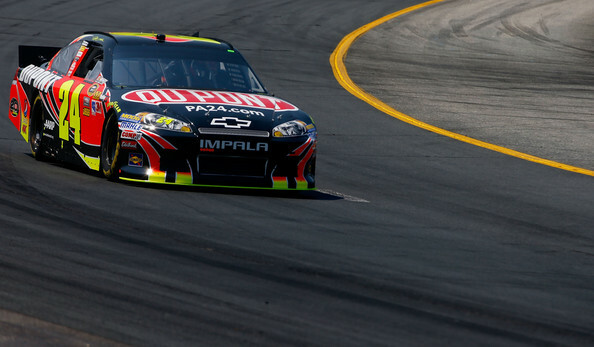 Gordon kept up a swift pace with fresher tires and took 14th from Dale Earnhardt Jr with 20 laps to go. He passed Bobby Labonte for 12th with 14 laps to go and moved to 11th around Carl Edwards with 11 to go. However, Edwards moved around Gordon to drop him to 12th with 6 laps to go. A debris caution with 5 laps to go brought a green/white/checkered finish. Gordon moved up to 11th for the restart after Denny Hamlin came to pit road for tires. He moved to 10th when Tony Stewart ran out of fuel with 2 to go. A pit stop on lap 219 hindered Gordon’s track position. He came onto pit road running in 8th place, but departed in 19th place after having to avoid a slower car coming in. The timing couldn’t have been worse since it was the final round of pit stops for the leaders. Nevertheless, Gordon regrouped in the final 40 laps to post a 10th place effort. 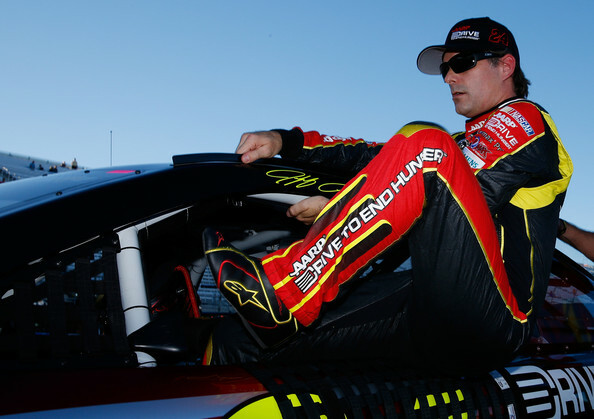 It wasn’t a victory for Jeff Gordon, but a solid 3rd place effort in the Sylvania 300 kept him from falling further behind in the NASCAR standings. It was Gordon’s fourth top-3 finish in the last 5 races. Gordon entered the event trailing by 47 points, and is now 45 points behind. Unfortunately, there are 11 drivers to overcome. 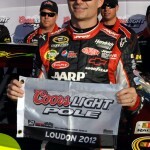 Gordon started on the pole and led the first 3 laps until Tony Stewart took the top spot. Kyle Busch moved past Gordon on lap 11. He held the 3rd spot until the competition caution on lap 40. 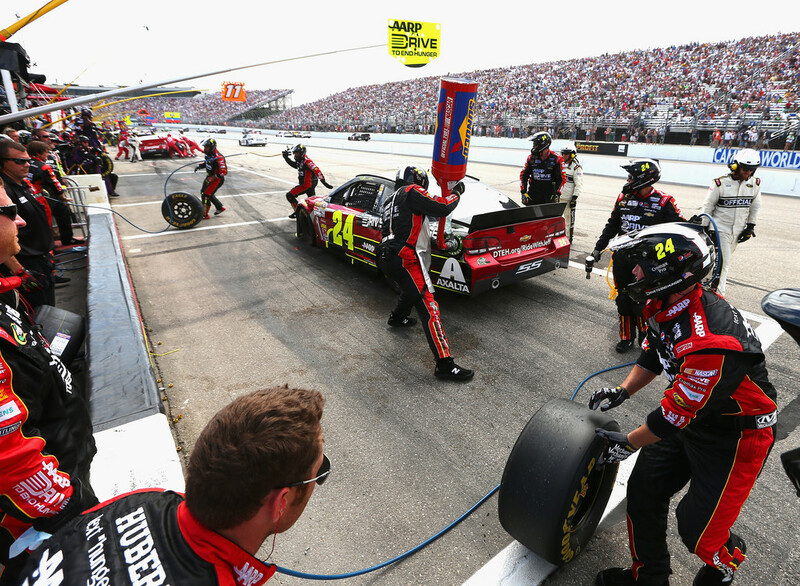 Gordon re-assumed the lead following pit stops as he accelerated from the first pit stall. 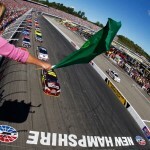 Busch took the lead from Gordon just one lap after the restart. 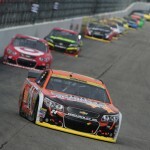 He dropped to 3rd on lap 70 after Kasey Kahne passed, and fell to 4th when Denny Hamlin went by on lap 76. He came to pit road for a green flag stop on lap 109 and held 4th place through the cycle of stops. A debris caution on lap 129 slowed the field and brought most of the leaders to pit road. Gordon restarted in 11th and moved into the top-10 on lap 135. At the halfway point of the event, Gordon moved to 8th but was complaining of a lack of rear grip in the car. 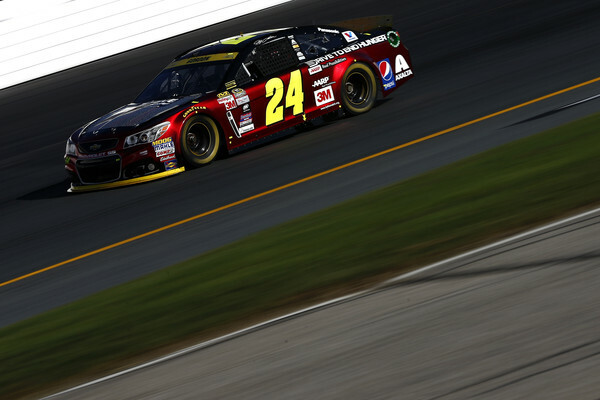 Gordon’s forward progress continued as he passed Kevin Harvick and Kyle Busch to take 6th place on lap 175. A debris caution on lap 178 brought pit stops. Gordon held 6th place through the stops. 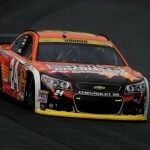 As Hamlin pulled away with a comfortable lead, Gordon took 5th from Tony Stewart on lap 231. He took 4th from Brian Vickers with 60 to go. Gordon’s final pit stop came under green with 53 to go. He cycled through in 5th after Brad Keselowski took 2 tires. After moving to 4th, the caution waved with 30 laps to go for debris. On the restart, Gordon jumped to the inside to take 3rd from Clint Bowyer. A debris caution with 30 laps to go gave Gordon the restart he needed to get past Clint Bowyer for his fourth top-3 finish in the last 5 races. Kasey Kahne held off a late charge by Denny Hamlin to claim his second win of the season and 14th of his career. 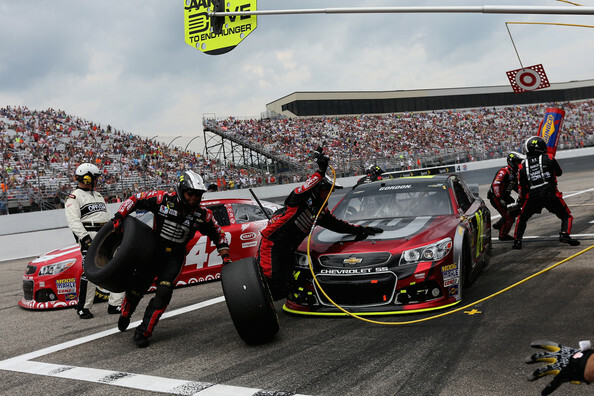 Jeff Gordon posted his fourth top-6 finish in the last 5 races with a 6th place effort in the Lenox 301 at New Hampshire Motor Speedway. However, Gordon remains 17th in the series standings and will need at least two victories to qualify for the Chase for the Championship. Gordon started 8th and moved up to 6th by lap 10. 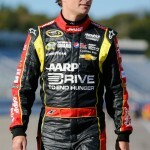 He entered the top-5 with a pass on Martin Truex on lap 23, and took 4th from Clint Bowyer on lap 32. Gordon led 1 lap before coming to pit road during a green flag stop sequence on lap 68. He returned to the race in 3rd position due to then-race leader Kyle Busch’s pit road penalty. A debris caution on lap 89 slowed the field and brought nearly all of leaders to pit road — except for one. Gordon stayed on the track and assumed the race lead. 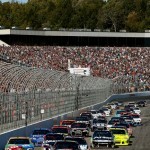 However, Gordon chose the outside lane for the restart and lost the top spot to Denny Hamlin entering turn one. He dropped to 3rd when Jimmie Johnson passed on lap 109. By lap 130, he dropped to 4th place as skies began darkening for approaching rain showers. Gordon came to pit road for a green flag stop on lap 146. He returned to the race a lap down in 20th place due to staying out on the track during the earlier caution. 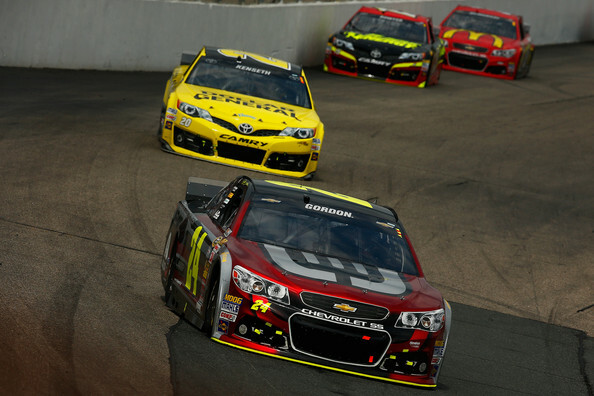 As the race leaders began pitting a few laps later, Gordon moved up to 2nd place behind Hamlin. 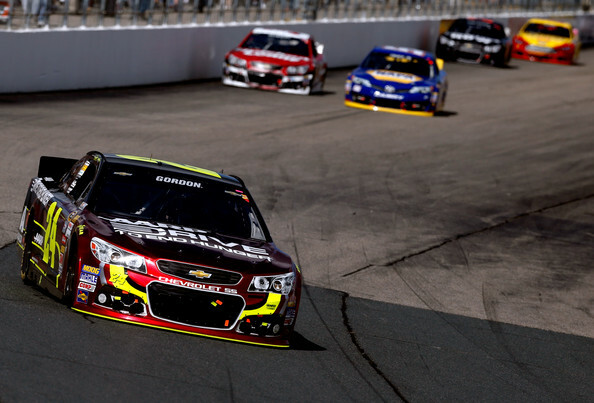 Gordon battled handling issues in the mid-stages of the race and dropped to 4th on lap 168. Brad Keselowski went by on lap 186 to send Gordon back to 5th. A debris caution on lap 191 brought the lead lap cars to pit road and allowed Gordon to get back on the same pit sequence. Gordon restarted in 10th place after changing four tires. Gordon moved to 9th before a caution on lap 232. Gordon came to pit road for his final pit stop and restarted 7th. He dropped to 9th when Hamlin passed on lap 250. However, he made in-roads and moved back to 7th with 35 laps to go. With 19 laps to go, he took 6th from Kevin Harvick. 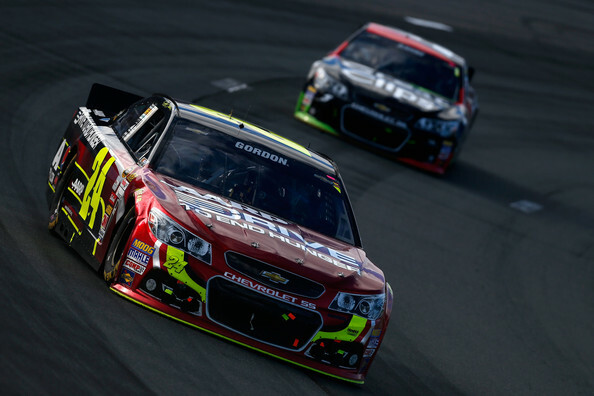 Mid-race handling issues hindered Gordon’s ability to stay in the top-5. A four-tire change on the final pit stop lost track position. NOT A BAD FINISH CONSIDERING YOU KIND OF TOOK A LONG WAY TO GET THERE? THE PIT STRATEGY YOU TALKED ABOUT YOU WERE IN A POSITION WHERE YOU CAN ROLL THE DICE IN SOME THINGS WAS THAT AN INDICATOR OF THAT TODAY? 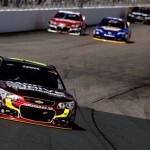 After a disappointing finish at Chicagoland Speedway, Jeff Gordon needed a solid effort at New Hampshire. Although he led the most laps and seemed to be in position to claim the victory with under 100 laps to go, a mistake on pit road forced Gordon to conserve fuel in the final laps. He finished a solid 4th — after leading 79 laps in the race — and moved from 11th to 5th in the points standings. 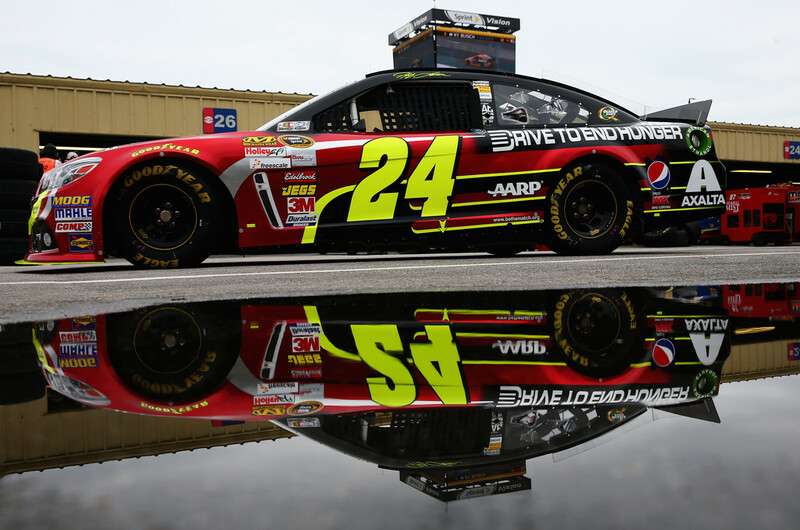 It was Gordon’s fifth top-6 finish in the last six races. Gordon started 7th and moved to 4th within four laps. He took 3rd from Brian Vickers on lap 6, but was unable to make significant headway closing on Ryan Newman and Kasey Kahne at the front of the field. 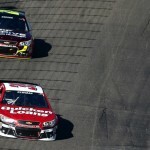 As the leaders came upon lapped traffic, Gordon closed in on Kahne’s rear bumper. 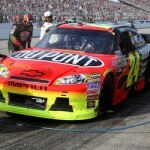 The handling on the DuPont Chevrolet became tighter later in the run and Gordon maintained 3rd place. He stayed on the track to lead a lap during a cycle of green flag pit stops on lap 64. Gordon took the runner-up spot from Brian Vickers on lap 68. A debris caution slowed the field on lap 86. Pit stops followed with Gordon exiting in 3rd place after taking two tires. 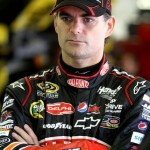 He restarted 5th due to Mark Martin and Juan Pablo Montoya staying on the track. At the 100-lap mark, Gordon ran in 4th place. He took 3rd from Newman on lap 112 and moved to 2nd when Martin pitted on lap 140. Gordon re-took the race lead when Kahne pitted on lap 147. A caution for Landon Cassill’s wall contact brought out the caution on lap 155. After pitting, Gordon restarted on the outside of Kahne on lap 161. He moved ahead of Kahne in turn 1 to take the lead. Matt Kenseth’s spin on lap 173 slowed the field and erased Gordon’s lead. Gordon once again pulled away on the restart and led comfortably at the 200-lap mark. He came to pit road during a cycle of green flag stops just as he ran out of gas on lap 231. Gordon cycled through in 4th place. 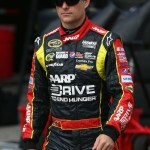 He took 3rd from Kahne on lap 253 and closed to within 2 seconds of Clint Bowyer for the race lead. 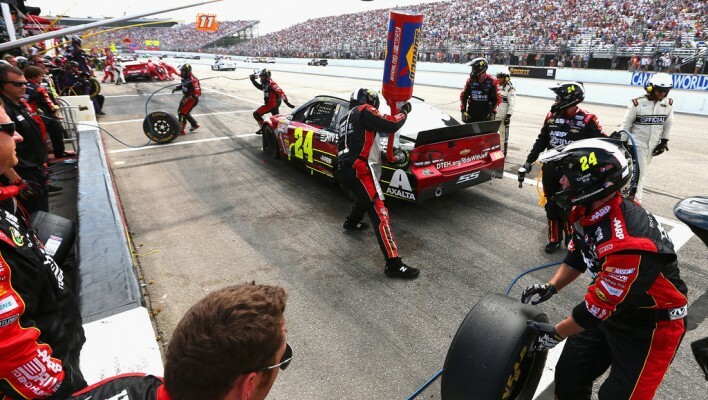 However, a problem on the final stop during the gas can exchange forced crew chief Alan Gustafson to ask Gordon to save fuel. He backed off the throttle and dropped 10 seconds off the race lead into 6th place. Gordon moved into the top-5 with 15 laps to go when Kahne pitted. He moved up to 4th when Bowyer ran out of gas. 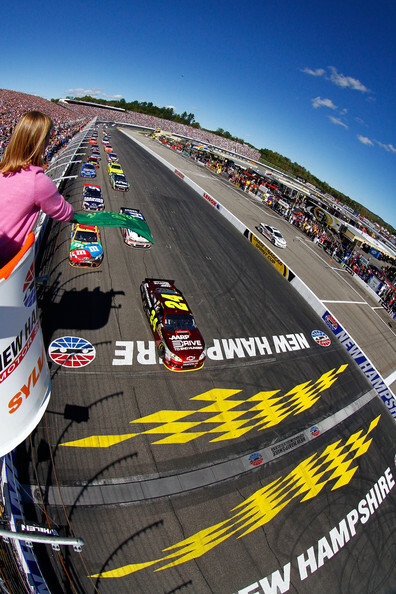 Road ahead: The series visits Dover Speedway for the second time in 2011. 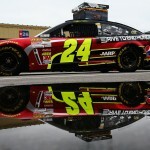 Gordon tested at the track in April, but has failed to contend for a Dover victory in the last few years. 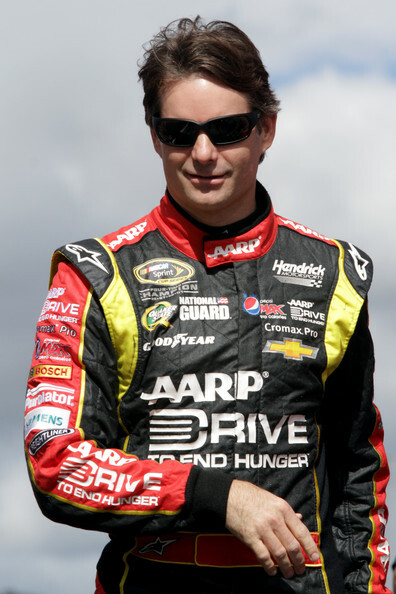 He has just one top-10 finish in the last 5 races at Dover. 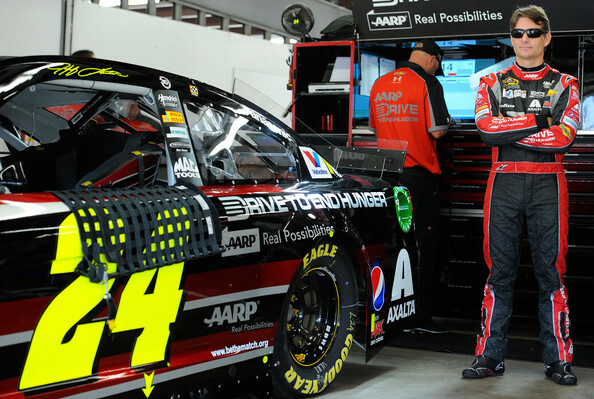 Gordon will be in the Drive To End Hunger car at Dover — the first time in his Cup career that he won’t have the DuPont oval on the hood at the 1-mile track. 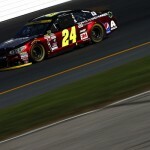 Jeff Gordon and the #24 battled through adversity at New Hampshire Motor Speedway and seemed poised for a top-5 finish. However, a flat tire on the final lap doomed their chances as Gordon finished 11th. He led 19 laps during the race, but a battery change at the halfway point put him a lap down. Gordon battled back and was running 4th on the final lap before the tire went down. Due to the battery issues, Gordon cut the cooling system in the car, which resulted in late race cramping in his legs. He battled through race traffic several times during the event, but did not have the finish to show for the superb effort. Gordon started 7th and dropped a spot in the opening laps. However, as the tire pressures came up, he took positions from Juan Pablo Montoya and Jeff Burton to move up to 6th on lap 8. Gordon moved into the top-5 on lap 29, just before a debris caution slowed the field. Pit stops followed with Gordon departing in 7th place after a two-tire change. He dropped to 9th within a lap of the restart, but regrouped as the run progressed. He moved back into 7th on lap 43 with a pass on Brad Keselowski. Gordon moved into the top-5 on lap 50, and took 4th from Burton on lap 53. Kyle Busch’s cut tire brought a caution period and pit stops. 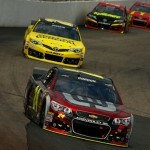 Gordon restarted 16th on lap 65, but was hindered by traffic and dropped to 19th. Gordon patiently made his way back and moved to 12th within 10 laps. He re-entered the top-10 on lap 80 and moved up to 6th when a debris caution slowed the field on lap 99. Gordon opted for 2 tires and restarted in 5th place on lap 105. He lost spots at the outset, but regained the positions on the longer run. On lap 120, he moved into the 4th position with a pass on Kurt Busch. He took 3rd from Burton two laps later, and the runner-up spot from Jimmie Johnson on lap 123. 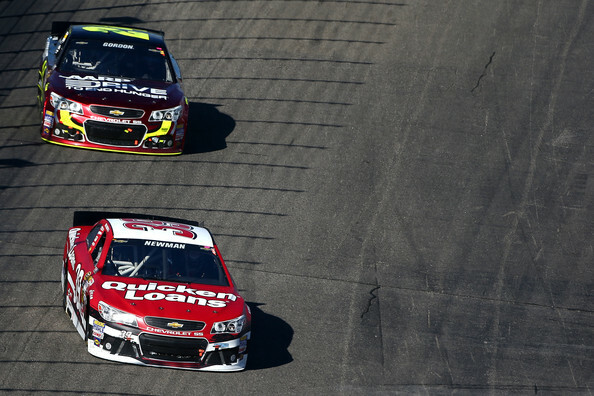 Gordon took the race lead from Kasey Kahne on lap 127. He opened a 3-second lead before a caution on lap 145 for Keselowski’s cut tire. Crew chief Alan Gustafson opted for a four-tire change and Gordon restarted in 10th place. On the restart, Gordon lost power and dropped to 35th. He switched batteries in the car and regained power. A caution for fluid on the track on lap 160 allowed Gordon to come to pit road and the crew swapped batteries. He lost a lap in the process and restarted 34th on lap 165. A caution for Denny Hamlin’s spin on lap 171 allowed Gordon to get back on the lead lap. He moved to 27th by lap 180 and was up to 24th when Mark Martin spun after cutting a tire. Gordon avoid his teammate’s spin and restarted 15th after staying on the track during the caution period. On lap 200, he took 11th from Kasey Kahne and closed in on the top-10. 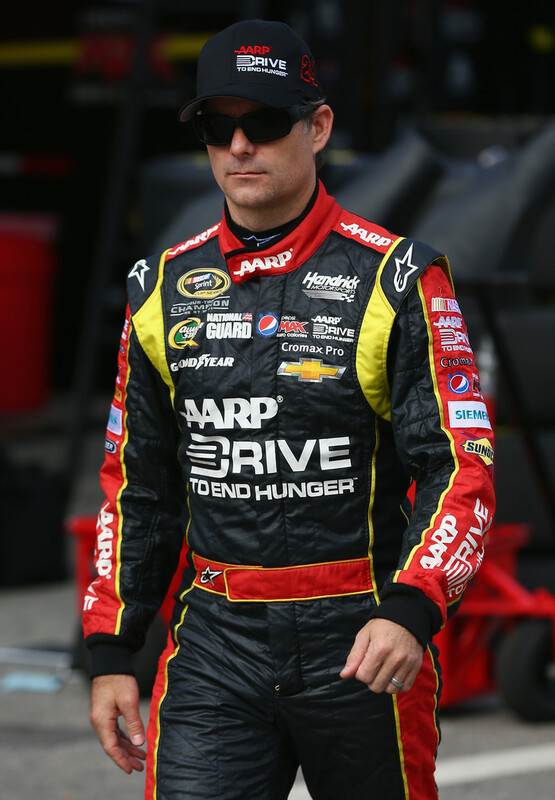 He passed Kevin Harvick for 10th on lap 204, and advanced to 6th when a debris caution waved on lap 215. Gordon restarted 17th after a tire change and moved to 11th on lap 225. During a caution flag for Brian Vickers’ wreck, Gordon came to pit road for the final time to top off with fuel and restarted 23rd with 70 laps to go. He re-entered the top-15 with 60 to go, just as caution slowed the field for Johnson’s spin. He stayed on the track and restarted 8th with 55 laps to go. He entered the top-5 on lap 249 and moved to 4th with 37 laps to go. 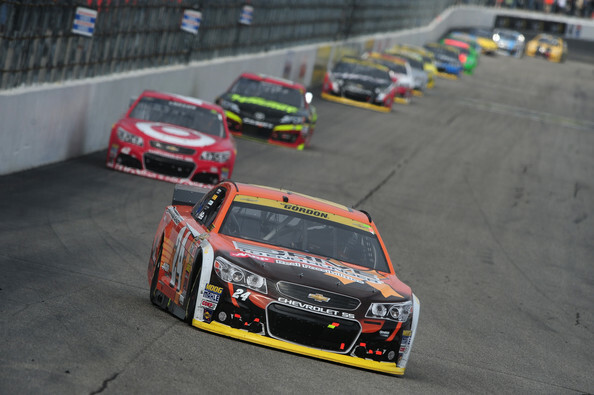 With 18 laps to go, Tony Stewart took 4th from Gordon — which essentially ended his hopes for a victory. 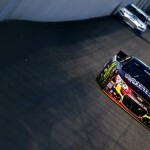 Gordon moved back into 4th by passing Kurt Busch two laps later. However, the day took its toll as he experienced leg cramping in the late stages due to cutting off in-car equipment to save battery voltage. Gordon came across the line in 11th place. Road ahead: The series takes a week off before heading to Indianapolis Motor Speedway for the Brickyard 400. Gordon will travel to the Democratic Republic of the Congo after Loudon as part of his work with the Clinton Global Initiative. Gordon will tour a refugee camp to get a firsthand look at the problems impacting the refugees in the Congo.